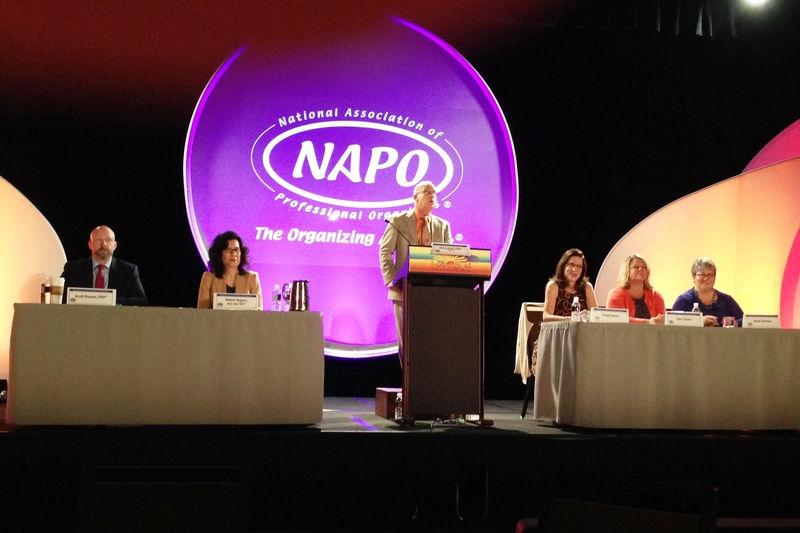 Golden Circle Ask the Organizers Panel, NAPO2014, Scottsdale, AZ. I’m the one on the right! Click here to learn about my experience as a juror on the first Menendez brothers’ murder trial. Time Management Tips, by Rebecca Roybal-Jones in Sage the Albuquerque Journal’s magazine for today’s woman! Networking for Introverts (85:00) ← Official recording of my NAPO2017 presentation, which includes Susan Cain’s TED Talk (The Power of Introverts), and my original content (Networking for Introverts), plus handouts. Video features slideshow and TED Talk. Audio features everything, including audience participation. Cost: $0-$30, depending on your status (or lack thereof) as a NAPO member. 02:20 Do clients know they are losing sleep due to disorganization? 05:00 Is there a perfect time management system? 00:55 How do we get so much clutter? 15:33 How much should you throw away? 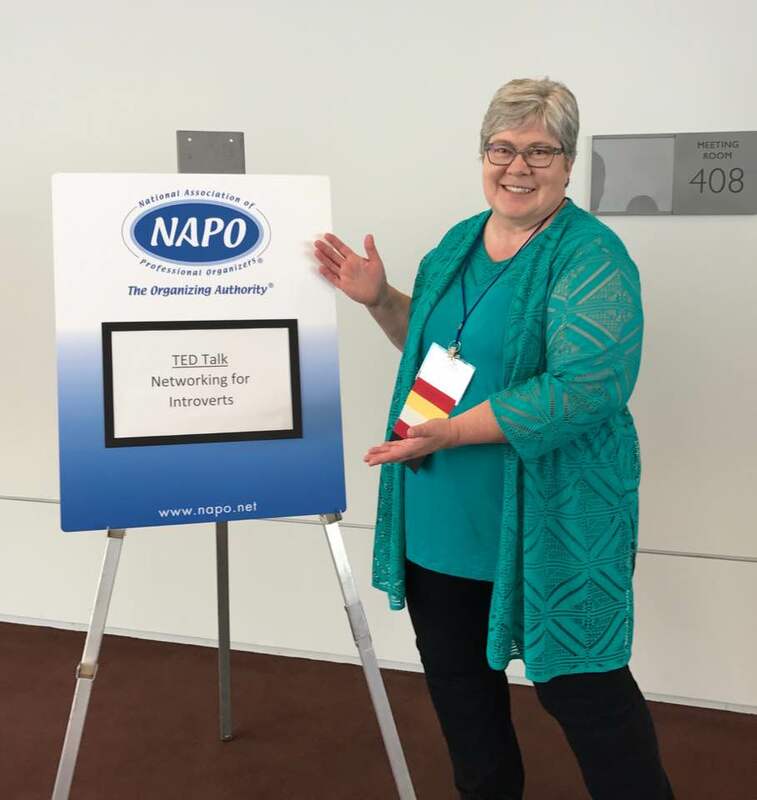 Networking for Introverts (85:00) <– Recording of my NAPO2017 session which includes Susan Cain’s TED Talk (The Power of Introverts), and my original content (Networking for Introverts), plus handouts. Video features slideshow and TED Talk, not me, in case you care. Audio features everything, including audience participation. Cost: $0-$30, depending on your status (or lack thereof) as a NAPO member. Who Will Check My Email When I Die? — Interview with Kate Stalter, posted January 17, 2017, on her America Talks Money podcast. • Organizing your digital life and digital documents. • The word legacy – what it means to people. • The implications of leaving your affairs in a state of clutter when you die. • The personal story which motivated Hazel to do what she does. • Your Legacy Contact on Facebook. • The implications of dying without a will. • Some of the most important resources to begin with, when organizing your life. • The Legacy Resource Roundup on Hazel‘s website and how it can help you. • What a digital will is and the benefits of having one. • Her Worry Matrix and how it can help you. Managing Your Time — KKOB AM 770 — Let’s Talk Business New Mexico — 38 min. → CLICK HERE TO LISTEN Scroll down to February 8, 2/10/14 (2/10 is when it was posted). The Professional Organizer’s Bible, by Ramona Creel (About Trademarking Your Name, p.395).